The 1st Battalion The Duke of Wellington’s Regiment, largely made up of National Servicemen was sent to war again. The 1st Battalion had set sail for Korea at the end of September 1952, to join the 1st Commonwealth Division.This was as a result of the United Nations decision to support the United States in resisting the invasion of South Korea, by its Communist neighbours from the North. The Battalion joined the Division at the end of September and soon found themselves in the front line, on May 13. With the Battalion occupying a position called the Hook, ‘The Dukes’ once again found themselves involved in serious military action. Virtually from Day one the regiment was under fire from snipers, mortars and artillery, with the first casualties occurring on the 19th, with one killed and 11 wounded, the following day saw the loss of another man killed and eight wounded. during the next seven days a further three were killed and 26 wounded. On the night of the 28th/29th May, following a huge artillery barrage, wave after wave of Chinese troops attacked the British positions on the Hook. Initially knocked back, ‘The Dukes’, under their Commanding Officer Lt Colonel Bunbury fought back fiercely, with two platoons fighting their way back up the line to regain the original ‘D’ Company trenches, that were ‘temporarily’ being held by the enemy. in the following 24 hours 10 men were killed and 51 wounded, with another 27 men missing. Throughout the battle ‘The Dukes’ were subjected to constant barrages of artillery fire, each followed by swarms of attacking Chinese troops. Being highly trained and aware of the importance of their position they kept their head and held the Chinese off. During the time on the Hook three officers and 17 ranks were killed, 95 men were wounded and 32 were reported missing. After a weeks rest the regiment went back into the line in the Naechon Valley where they stayed till the war finished. After a further brief rest on the Imjin River the Battalion left Korea in November 1953 for service in Gibraltar, with their fine reputation enhanced. Following the Korean War the battalion began a cycle of tours lasting thoughout the Cold War and beyond. It was an extended period of variety and contrast, often demanding rapid reroling to cope with differing roles and tasks. b. Supporting and contributing to the internal security of British Protectorates. c. Taking part in the Internal Security operations in Northern Ireland in the form of both short emergency tours and two year tours. After a tour of Gibraltar, the Dukes returned to the UK in 1956. The Suez crisis began in July of the same year and the Regiment left England with the intention of landing in Libya, but actually landed in Cyprus. The 1956 tour saw the Dukes operating in a largely anti-terrorist role, which they performed efficiently and with good results. 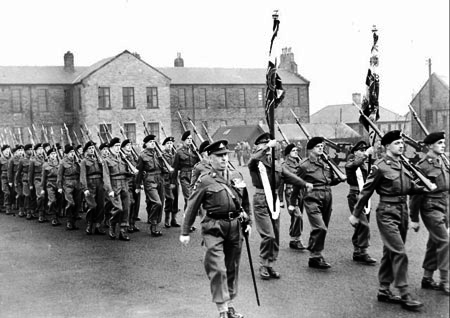 In September, 1957, the Battalion moved to Palace Barracks, Holywood, just outside Belfast, Northern Ireland, and then back to England (briefly in Brentwood) in October, 1959, in order to join the new UK Strategic Reserve as part of 19 Infantry Brigade Group, in Colchester. In July, 1960, as Spearhead battalion, the First Battalion was rushed to Kenya for 5 months to stiffen 24 Brigade when the Independence talks in Nyasaland threatened to break down. The following year, 1961, the Battalion was sent back to Kenya to provide cover for the troops sent to Kuwait, to offer protection from its ambitious neighbour – Iraq. During a spell in Catterick the battalion was again required to provide company groups on unaccompanied tours: in 1962 Burma Coy (commanded by Major Donald Isles) spent 9 months in British Honduras, as did Alma Coy (commanded by Major Rodney Harms) in 1963. The Cold War became very real in the 1960′ s with the battalion spending an increasing amount of time in West Germany, as part of the British Army of the Rhine (BAOR) and NATO. As the infantry had to adapt to mechanised and armoured warfare on the North German Plain, subsequent ‘tours of duty’ lasted between 4 and 6 years. One such tour was spent in Osnabruck from 1964 to 1968 as part of 12 Infantry Brigade Group, equipped with Humber FV1611 APCs – the famous ‘Pig’. The tracked AFV 432 was introduced in 1966/67. Much of the battalion’s time was spent on exercises in Germany, Norway and Denmark, balanced by a number of golden seasons on the Rugby field. The battalion was sent in April 1967, to join the United Nations Force in Cyprus (UNFICYP) for six months. See CO’s Recollections. After a brief spell in Gillingham, Kent, the battalion was sent to Hong Kong in 1969 for two years. In 1971 the Dukes were posted to Northern Ireland on operational duties. In the years to come the Battalion would spend a significant amount of time as both the resident and roulement (rotation) battalion in the province. In 1972, during a four-month emergency tour in South Armagh and Ballymurphy, the Battalion suffered three men killed. March of the following year, 1973, saw the Dukes move from Catterick to Ballykelly, County Londonderry, on an 18 month residential posting. A two year posting to Gibraltar, plus exercises in Canada and Belize were intermingled with sporadic tours of Northern Ireland, culminating, in January 1987, with a two-year tour of duty back at Palace Barracks, Holywood, Belfast. As spearhead battalion, in late 1990, and March 1991, the Dukes were tasked with assisting the outloading of stores from UK bases to the Gulf region for the First Gulf War. In 1991 the Dukes Band was deployed, at short notice to the Gulf, on “Operation Granby 1”. They formed part of the RMA element of 28 Gurkha Ambulance Group. On the 13th of January they were in situ at the two forward dressing stations of 1 Armoured Group Field Ambulance, Alpha 1 and Bravo 1. Their role was to provide small mobile teams providing medical care for casualties during their evacuation to the Field Hospital. They were amongst the first to be entitled to put back on their sleeves the famous ‘Desert Rat flash’ of 7 Armoured Brigade. The announcement of the Government’s “Options for Change” programme caused ructions within the entire British armed forces. The Dukes were one of the few Regiments that remained untouched by these changes. Further alterations occurred the next year and it was announced that the 3rd/4th Battalion Yorkshire Volunteers would reform as the 3rd Battalion The Duke of Wellington’s Regiment (West Riding) (Yorkshire Volunteers) with their HQ in Sheffield. From July 1991 until 1993, stationed at Bulford, the Dukes joined the Allied Command Mobile Force (Land) or AMLF (L). This meant the Dukes were not only the sole British infantry unit in the AMLF, but they were also required to be trained in mountain and arctic warfare. The Battalion spent a great deal of time on exercises in Norway, on NATO’s northern flank, in particular on Exercise ‘Hard Fall’ in 1993, in Norway. 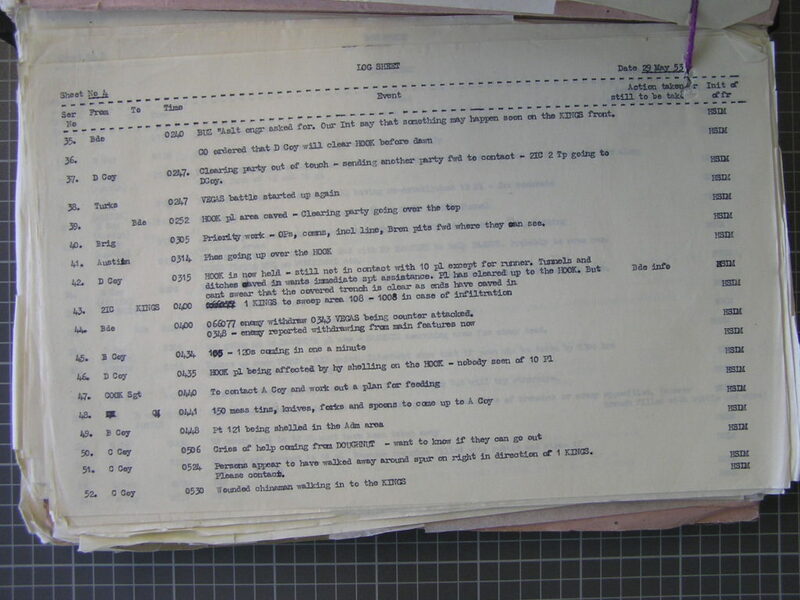 In February of that year, the Battalion moved, within Bulford, to re-roll, again, as a Mechanised Battalion, this time though, equipped with “Saxon1” wheeled armoured vehicles, as a part of 1st Mechanised Brigade. The Dukes were hurriedly put on standby to cover the troubles that had arisen in the Balkan state of Bosnia and, in March 1993, the Battalion arrived in Bosnia. 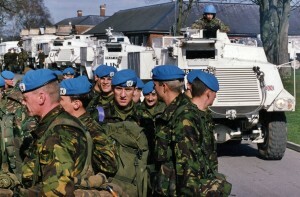 Deployed – initially to Bugojno and then to Gorazde, the Dukes made a significant contribution to the United Nations Mission, so much so they were subsequently granted 13 Operational awards, including the first ever award of the Conspicuous Gallantry Cross (CGC) to Cpl Wayne Mills for an action in May, 1994, near Gorazde, and a Distinguished Service Order (DSO) to Lt Col DM Santa-Olalla, the Commanding Officer during the tour. In March 1994 the ‘Dukes’ deployed to Bosnia, with an area of responsibility covering Bugojno, Vitez, Travnik and the besieged enclave of Gorazde. The latter was under siege for much of the war. It was declared a UN Safe Zone in that year. The ‘Dukes’ were one of the first units to enter the town. The Regiment pushed the Bosnian-Serb Army from their positions around the town to a distance of over one mile. Their objective in doing this was to create a safe zone for the town. 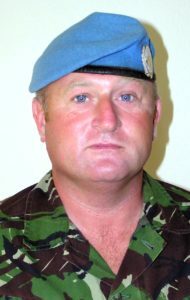 While at Gorazde, Private Shaun Taylor of C Company was killed during an engagement with Bosnian-Serb forces while manning an observation post. The engagement lasted fifteen minutes, with over 2,000 rounds of ammunition being expended by the ‘Dukes’. Several of the Bosnian-Serb soldiers were killed in the fire-fight. Gorazde remained a safe zone, being held by British troops from 1994 to 1995. It was the only safe zone to survive the war and avoided the tragedies that occurred in other UN safe zones such as Srebrenica and Zepa. Corporal Wayne Mills of the 1st Battalion became the first recipient of the Conspicuous Gallantry Cross, which is second only to the Victoria Cross. On the 29th of April, 1994, a patrol led by Corporal Mills came under heavy small-arms fire from a group of Bosnian-Serbs. The patrol returned fire, killing two of the attackers. The patrol then withdrew, but the attackers persisted in firing on the patrol. The patrol soon reached an open clearing, where it was obvious they would be highly vulnerable to fire from the attackers. Corporal Mills then performed an astonishing feat of bravery. He turned back and engaged the group in a fire-fight, delaying the attackers long enough to allow the rest of his patrol to cross the clearing. During the fire-fight, Corporal Mills shot the leader of the group and the rest scattered into the woods. Due to that action he returned to his patrol safely. Lt Col David Santa-Olalla received the Distinguished Service Order for his inspirational leadership and courage during the ‘Dukes’ deployment to Bosnia. He personally arranged for the mutual withdrawal of Serbian and Muslim forces from the besieged town of Gorazde, just as the Geneva talks were being held on the town. He was a truly competent leader during the Bosnia deployment, being first on the scene whenever an incident occurred. In February 1995, the ‘Dukes’ were again posted to Northern Ireland for a two year tour of duty, as the Province Reserve Battalion. In March, 1997, The Battalion was with 42 Bde, 2 Div, as Mechanised Infantry with Saxon Armoured Vehicles. There were deployments to Gibraltar, and Waterloo Company was reformed for deployment to the Falkland Islands, from July to November. C Company was deployed to Oman in October 1997. From February 1998, until March 2000, the Battalion was posted, in a light role, to London District, on public duties, though various units were deployed on a mixture of other duties:- in 1998, C Company deployed for a tour of duty in South Amargh. From February to March 1999, B Company was on exercise in Belize, C Company deployed to Northern Ireland from March to August, units were on exercise in Canada and a platoon was attached to the 1st Battalion of the KOSB, in Kenya, from October to December. In February 2001, a company from the ‘Dukes’ was deployed to Kosovo, with the objective of preventing arms and munitions being transported from Albania into Kosovo, and then onto the ‘Former Yugolav Republic Of Macedonia’ (FYMOV), now known as the ‘Republic of Macedonia’. This deployment ended in July 2001. In 2003, the ‘Dukes’ were part of Operation Telic 1, the invasion of Iraq, as part of 1st (United Kingdom) Armoured Division. Later that year the Regiment celebrated its 300th year in existence. At Belfast Barracks in Osnabruck, Germany, over 2000, past and present, members of the Regiment converged to take part in the celebrations. The ‘Dukes’ were presented with new Colours by HM Queen Elizabeth II, represented by The Colonel of The Regiment ‘ Major-General Sir Evelyn John Webb-Carter KCB’ (now KCVO OBE), due to the ill health of the Queen’s representative, the 8th Duke of Wellington. During 2004 The Battalion was deeply immersed in infantry skills training in Bergen Holne, Germany, and BATUS Canada, where they did a considerable number of live firing exercises, followed up by a ‘live’ exercise, using computer targetting simulators hooked into their vehicles against a free ranging and independant enemy force. The Battalion returned to Osnabruck just five weeks before deploying, again, to Iraq on OP TELIC 5 in October. As part of 4 (Armoured) Brigade, they went to the South-East of Iraq, to join the British-led Multi-National Division (South East), as a fully equipped Armoured Infantry Battalion with Warrior Armoured Personnel Carriers. On 6th of June 2006 the Duke of Wellington’s Regiment (West Riding) rebadged to become the 3rd Battalion, The Yorkshire Regiment (The Duke of Wellington’s). On 25th of July 2013 the Yorkshire Regiment reorganised in readiness for the Army 2020 changes. The 3rd Battalion renumbered to become the new 1st Battalion (1Yorks).